The 2018 1oz American Eagle is an essential buy for any coin fan. Since its debut in 1986, the American Eagle has cemented its place among the world's most important gold coins. These striking coins remain almost the same from year to year, but many collectors pride themselves on owning the entire range. Coupled with its immense tradability, demand for the 33rd edition of this iconic investment coin is likely to be high – order yours now with coininvest.com. 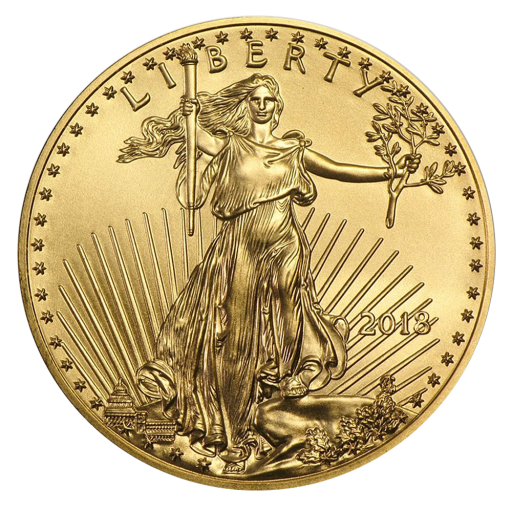 All American Eagle gold coins are struck from gold that has been mined within the United States and the 2018 1oz Gold Eagle is no exception. Each coin is legal tender and backed by the US Government although its face value of $50 (US) is far lower than its true worth. With a purity of 916.7/1000 (22 carat),these well-loved coins are ideal for investors at every level. The coin's obverse carries an updated version of the famous striding Lady Liberty complete with olive branch and torch. The image was originally created by Augustus Saint-Gaudens for the 'Double Eagle' coin that was issued by the United States Mint from 1905 to 1907. The Double Eagle is still hailed as one of America's most beautiful coins. The obverse also features the year of issue, 2018, and the word 'LIBERTY', while 50 stars representing the 50 states of the union ring the coin's edge. The reverse design by acclaimed artist Miley Busiek is no less appealing; a male bald eagle approaches his nest carrying a branch as the chick and female wait. The reverse of the 2018 1oz American Gold Eagle carries the words ‘United States of America’ and ‘E Pluribus Unum/In God We Trust’ along with the coin's denomination and weight. Order your 2018 1oz Gold American Eagle coins without delay at coininvest.com. Coins are shipped single in sachets, as tubes of 20 or in monster boxes of 500.